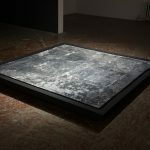 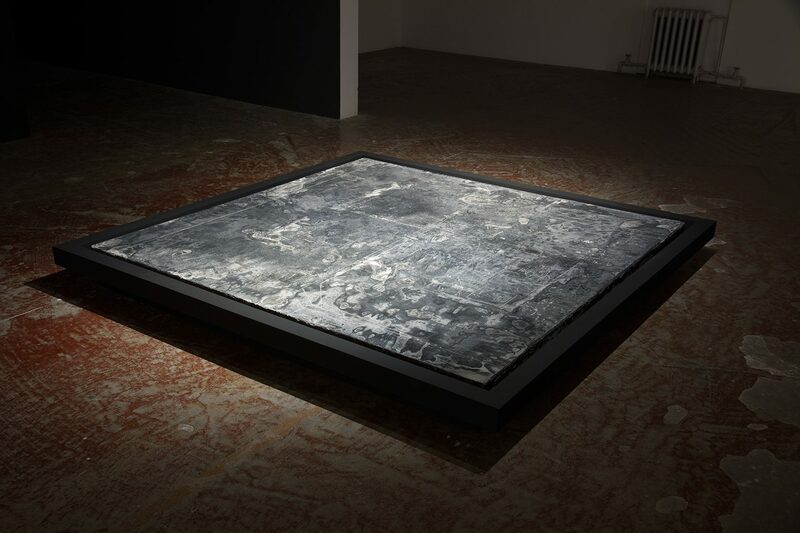 The repercussions of a world in conflict cast a long shadow over “Ce qu’on ne voit pas qui nous touche.” Paintings and drawings on the walls and several platforms on the ground are spatially arranged to delimit the edges of a disquieting terrain. 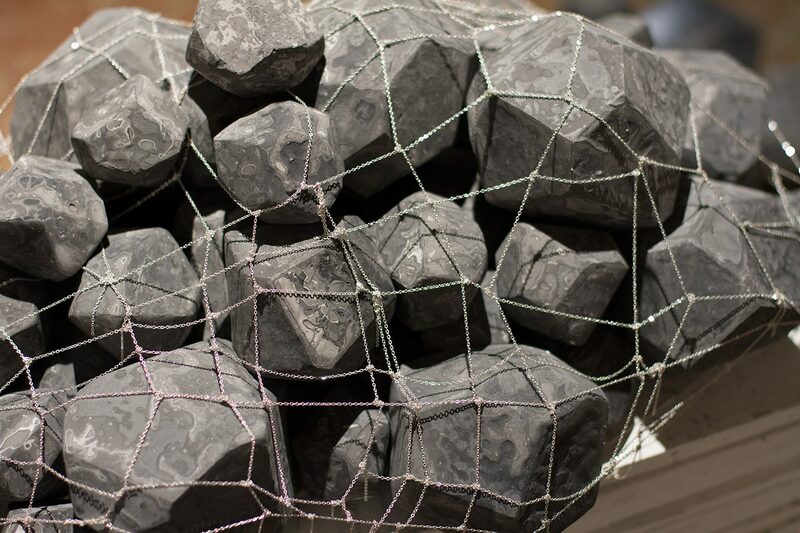 These create a stage for sculptures that, like viewers, occupy a familiar and threatening landscape. 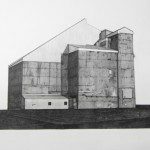 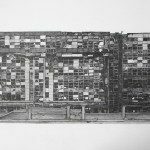 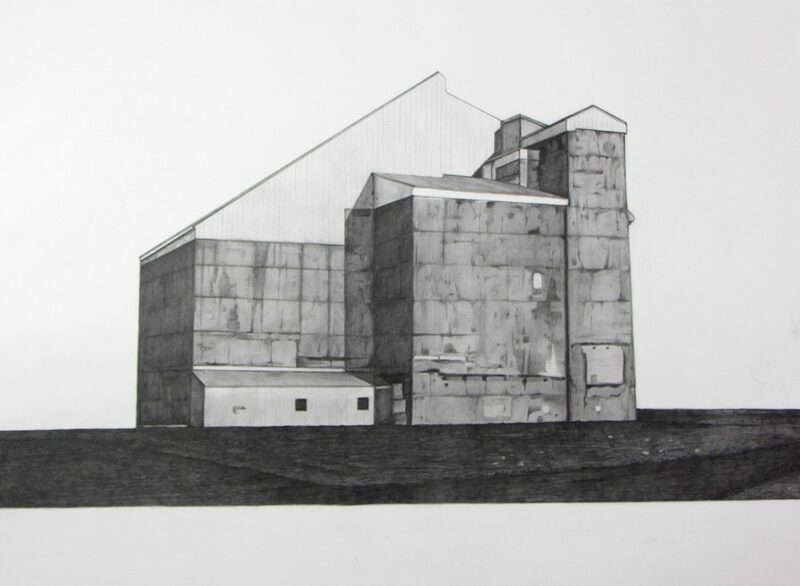 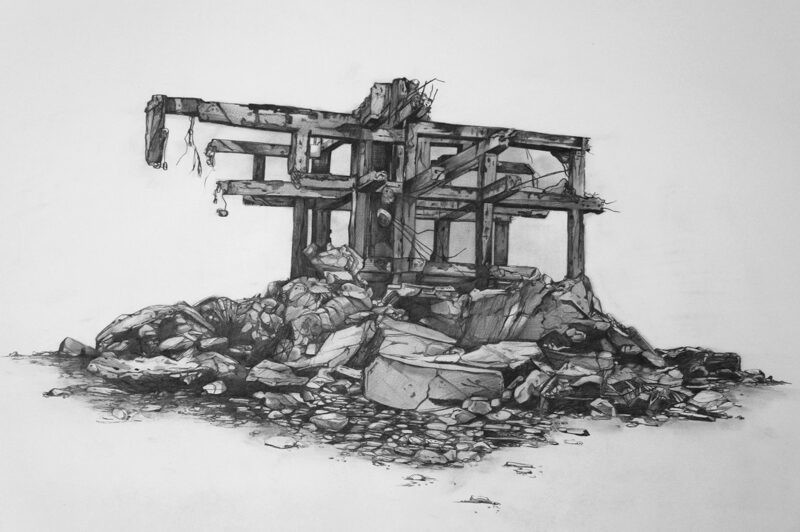 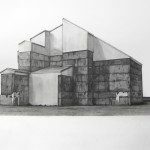 While images of disasters that permeate mass media may lead us to imagine distant geographies, they feel like alarmingly proximate recurrences in Bilodeau’s drawings of deteriorating structures. 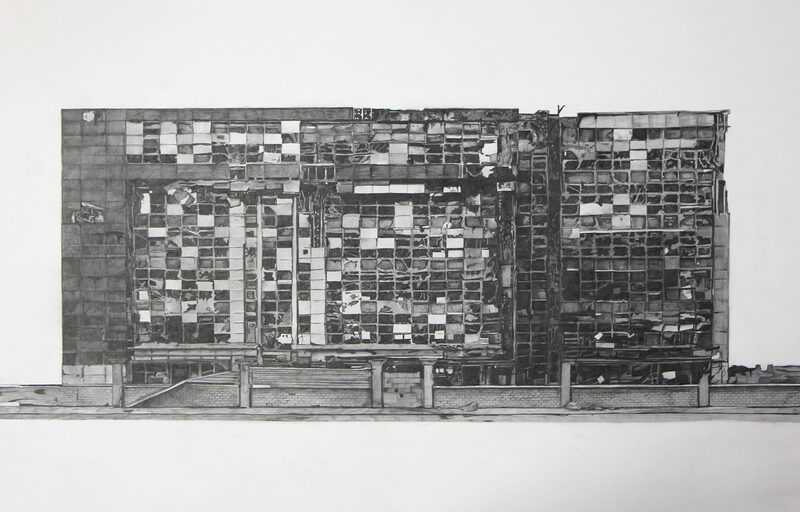 These include what could be a housing complex destroyed in a violent conflict and a collapsed apartment bloc. 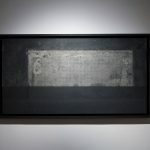 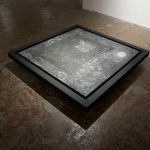 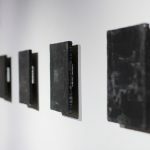 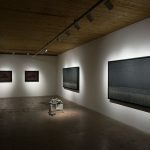 Protected by dark tinted glass, the works confront viewers with the inexorable violence that often remains obscured to frame and conceal the crumbling foundations of larger social, political and economic structures. 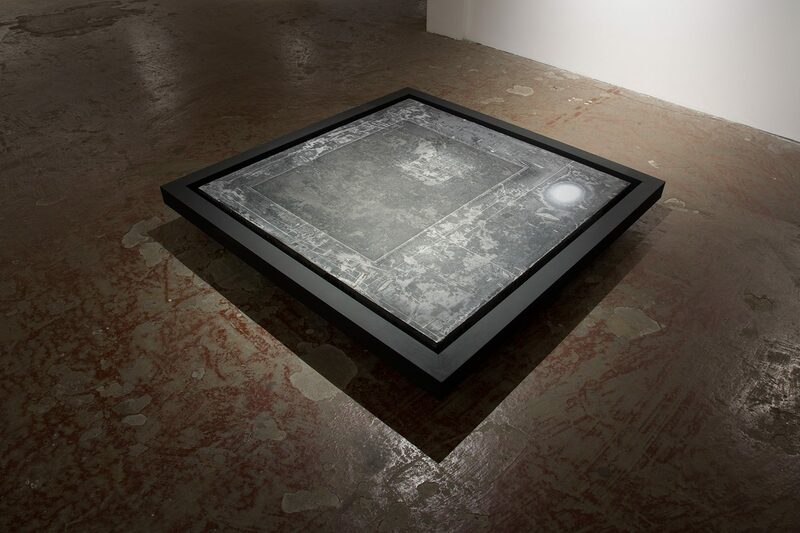 The viewer’s reflection in the glass might eclipse the tinted image; perhaps it is only through the acknowledgement of our responsibility that we can perceive the violence that happens elsewhere. 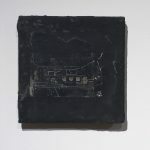 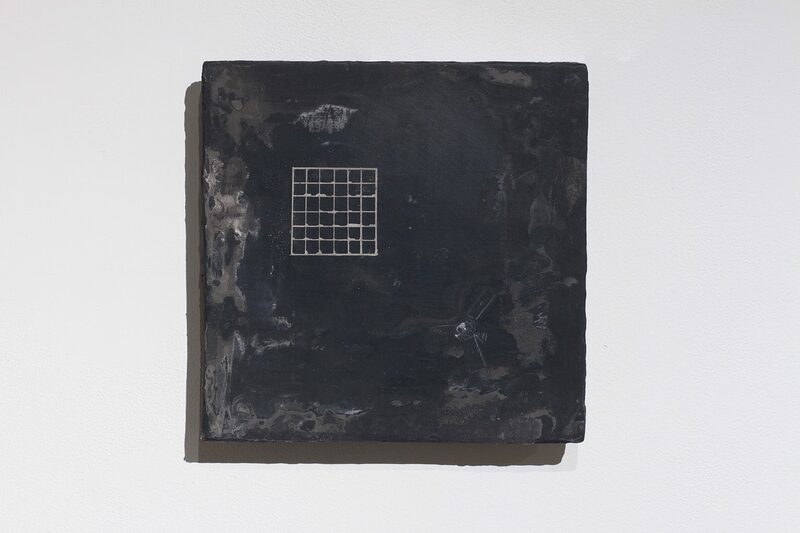 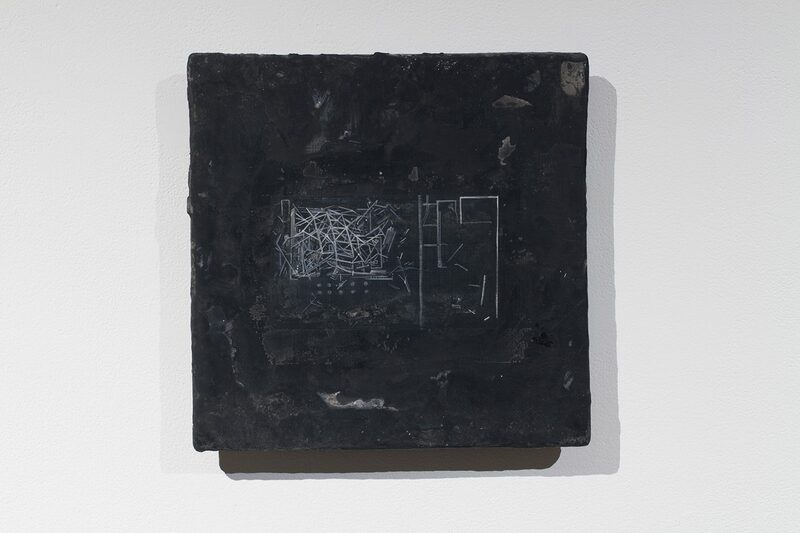 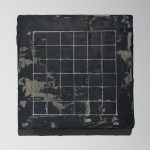 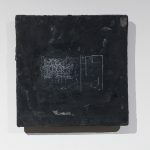 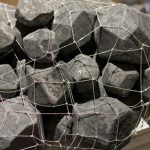 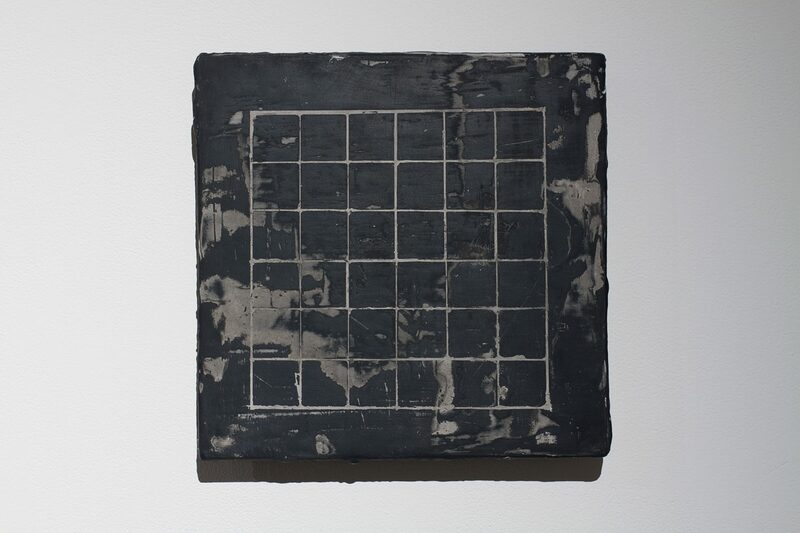 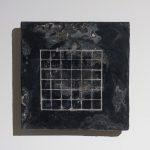 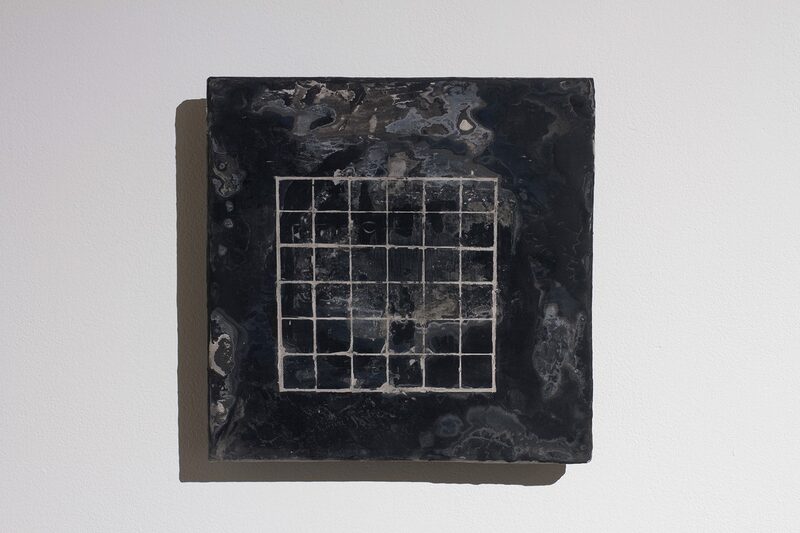 A shattered cube that has been reconstructed evokes the destruction of the buildings brought to light in Bilodeau’s drawings. 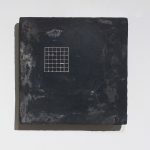 The act of smashing a quintessential Minimalist object connects the absurdity of destruction with the rationality associated with the cube. 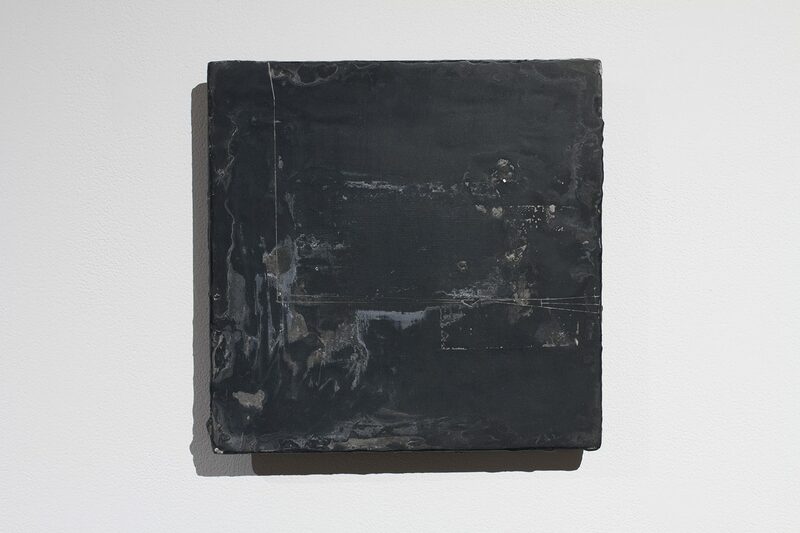 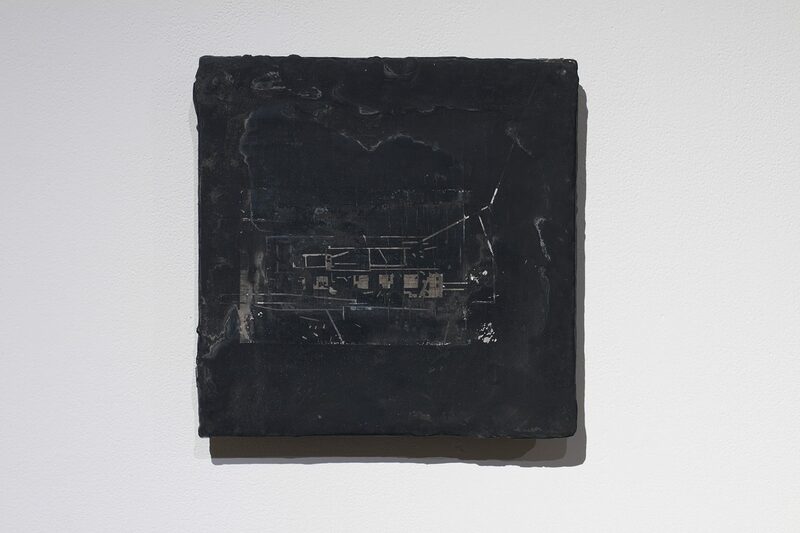 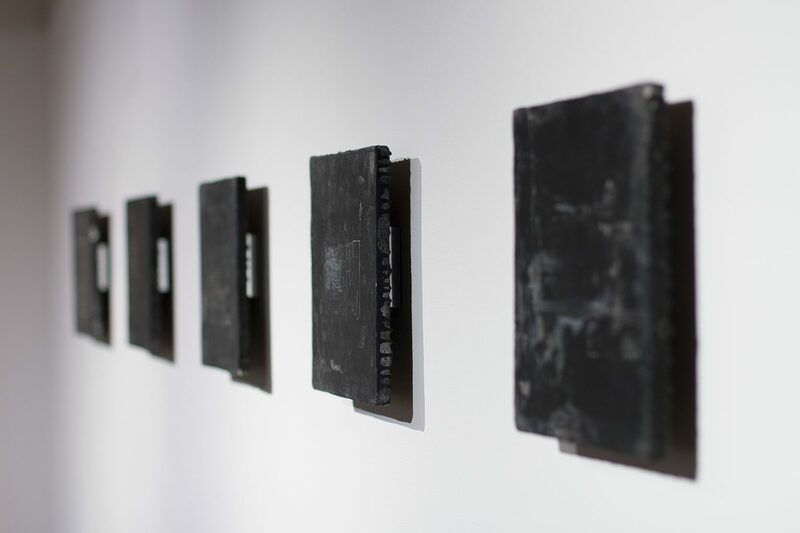 Bilodeau often creates artworks with the debris of previous exhibitions. 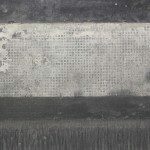 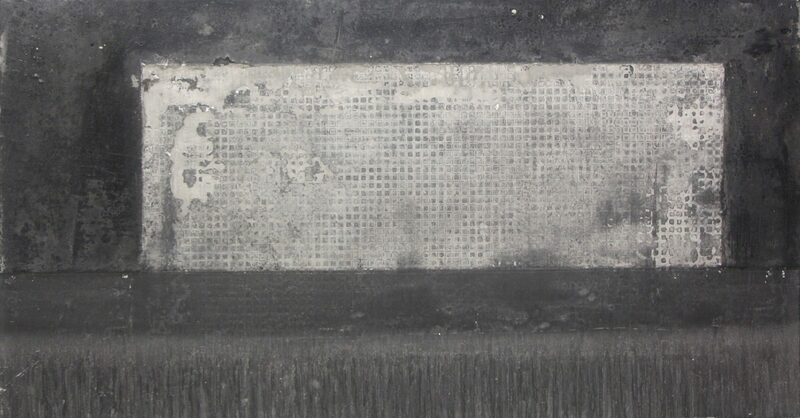 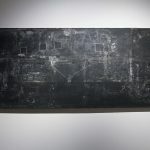 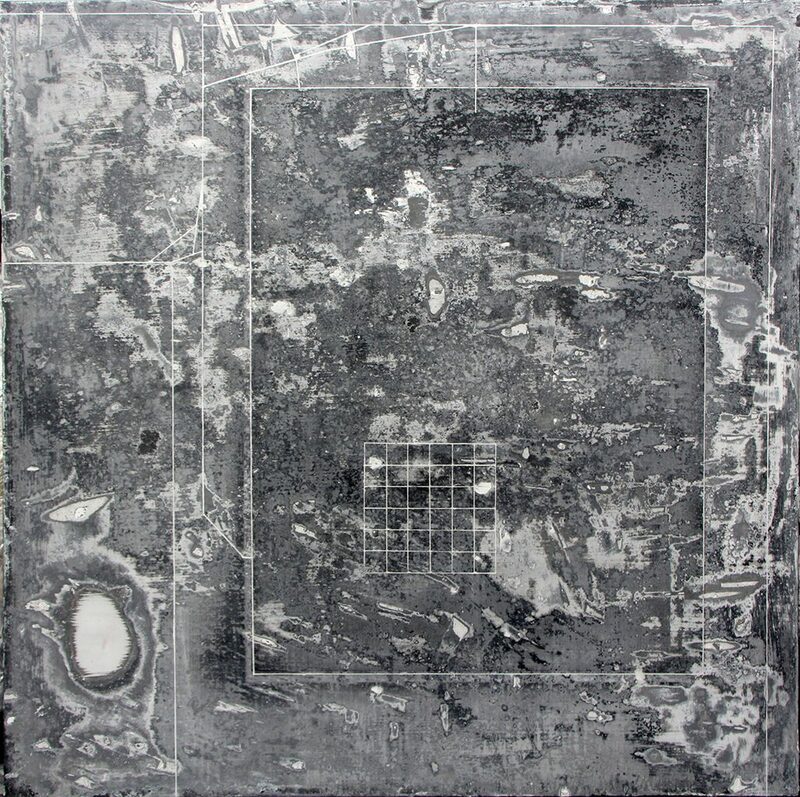 The platforms, covered in layers of paint accumulated from other works, evoke satellite or aerial views; lines could separate or connect, be borders or part of a topographical grid. 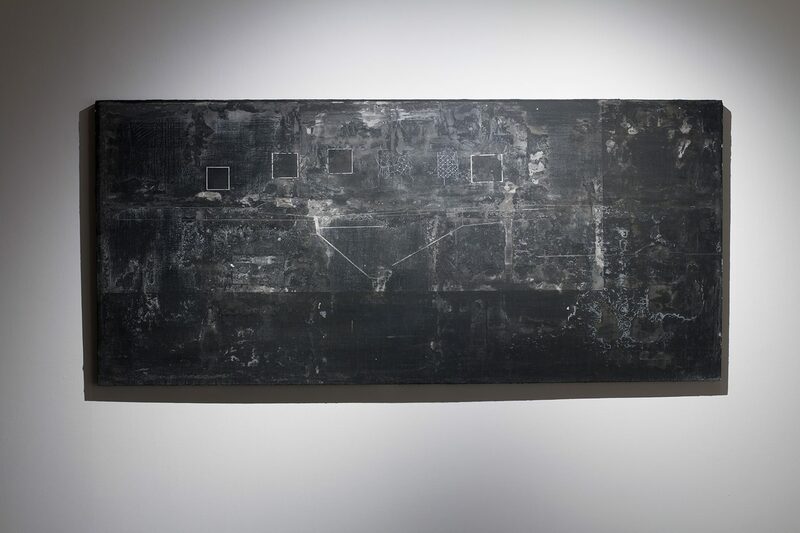 Splatters of paint seem to have exploded and sanded down areas suggest depleted terrains or bombed targets. 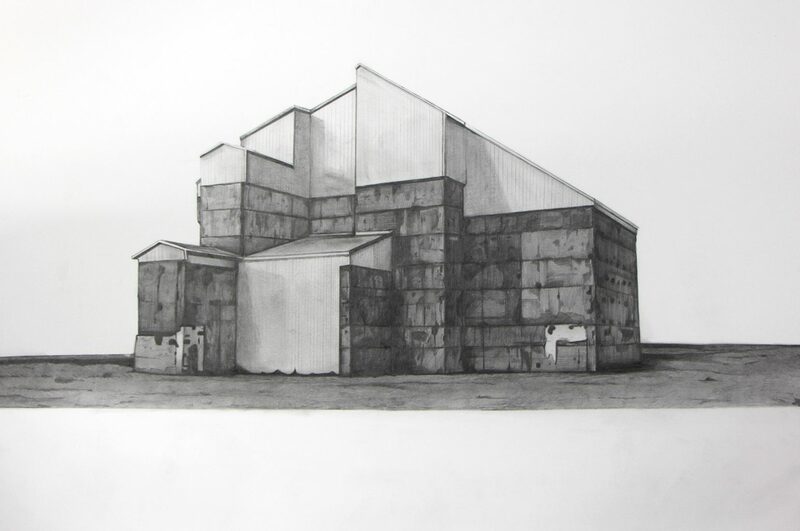 These are landscapes of hope and despair that could have been depopulated, re-imagined, or destroyed. 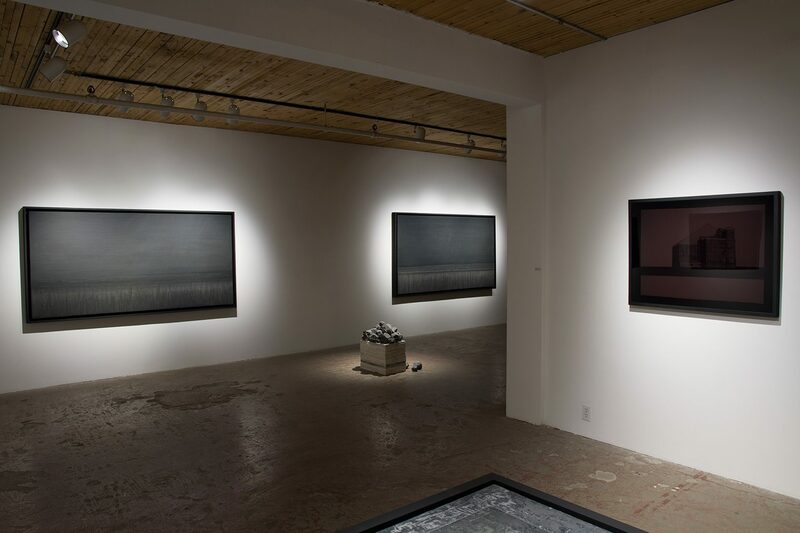 While these ground works give an aerial view of a divided world, Bilodeau’s paintings anchor conflicts in the territories we inhabit and the skies above. 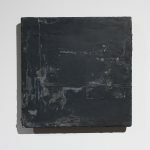 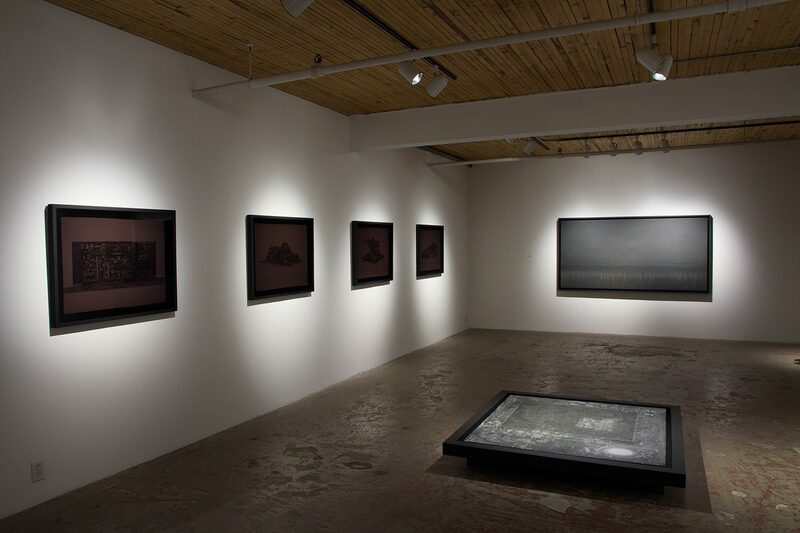 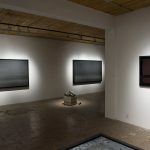 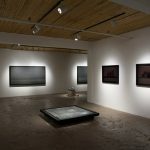 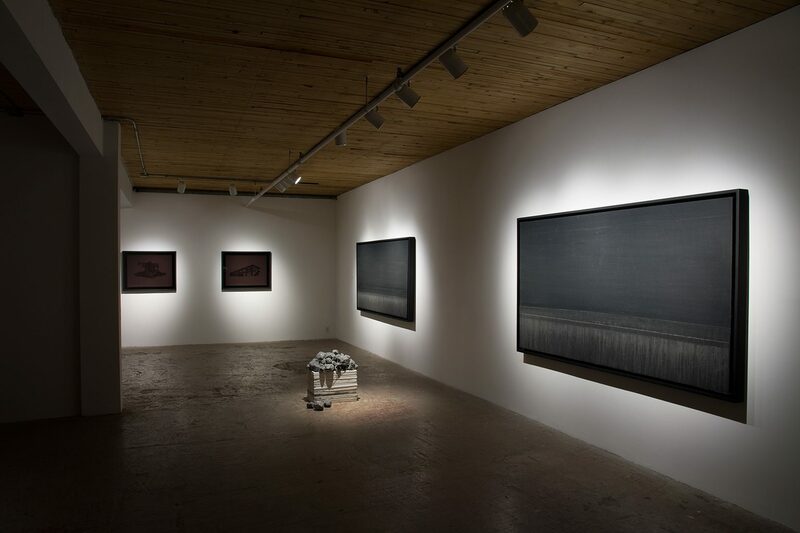 Bilodeau uses a sombre palette in paintings that are devoid of any visual reference except for a horizon line, a device that is often used to establish perspective. 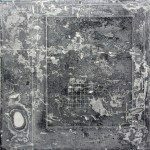 If abstract art attempts to arrive at a degree of independence from recognizable references, these works suggest an “elsewhere” that is neither here nor there. 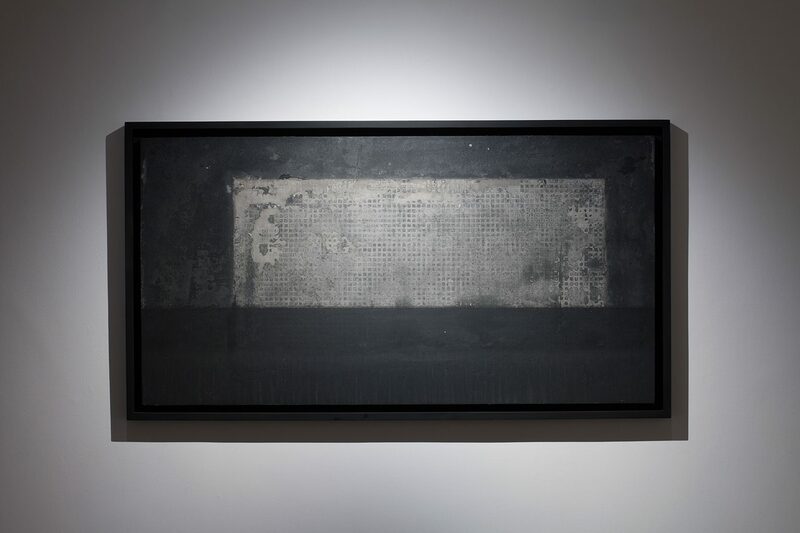 Their “blankness” reveals what we do not see; the dividing lines could be a patrolled border, an enclosing wall or a city that has been razed. 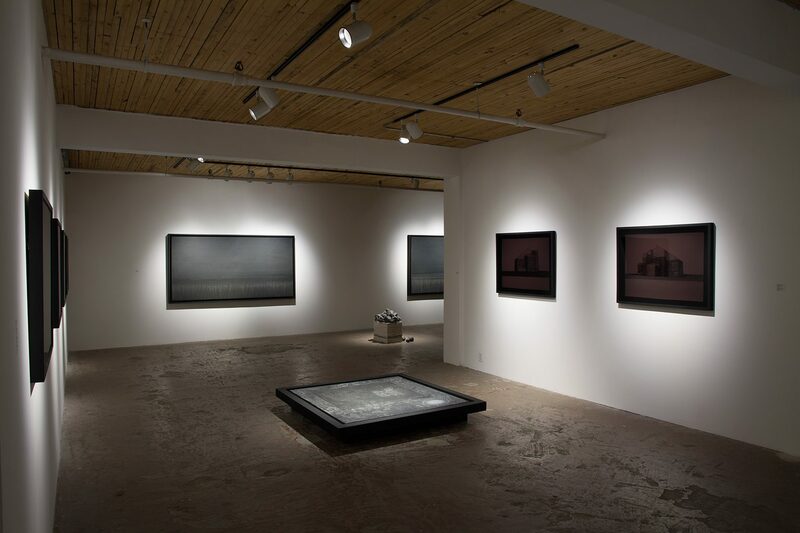 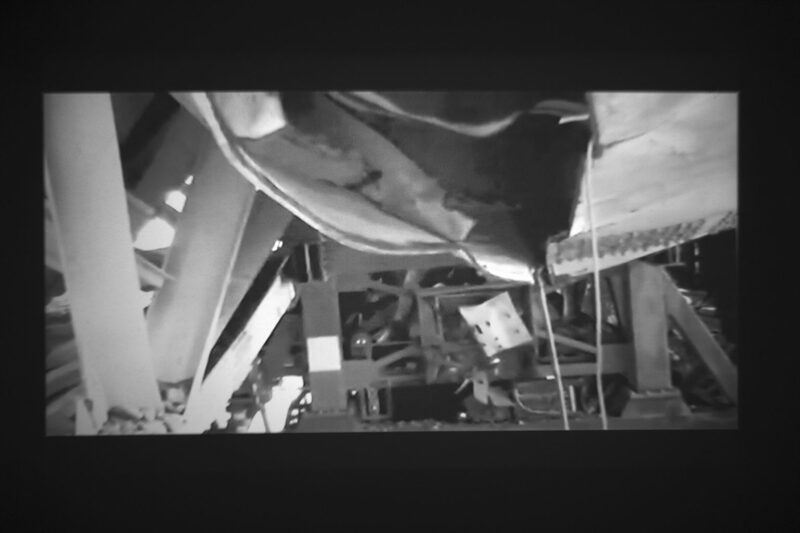 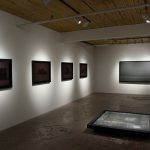 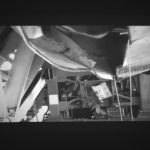 Amid the relentless violence that threatens to destroy the earth, Bilodeau’s works shine a light on the blind spots that obstruct the structures which maintain injustice. 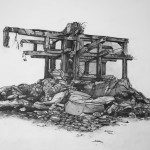 From the exploitation of resources to the bombings of civilian’s homes, what seems to happen only elsewhere unfolds in front of our eyes.